This is an open access title available under the terms of a CC BY-NC-ND 4.0 International licence. It is free to read at Oxford Scholarship Online and offered as a free PDF download from OUP and selected open access locations. 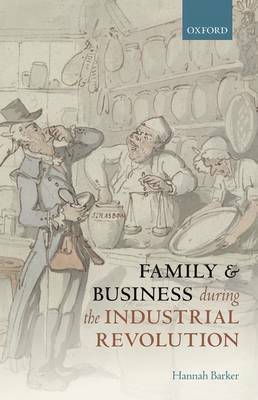 Family and Business during the Industrial Revolution is about the small businesses that were at the heart of the economic growth and social transformation that characterized the industrial revolution in Britain. It challenges existing visions of the commercial landscape during this period, by examining some of the forgotten businesses of the industrial revolution, and the men and women who worked in them and ran them. Its approach, which spans economic, social, and cultural history, as well as encompassing business history and the histories of the emotions, space, and material culture, alongside studies of personal testimony, testatory practice, and property ownership, tests current understandings of gender, work, family, class, and power in the late eighteenth and early nineteenth centuries. It provides us with new insights into the lives of ordinary men and women in trade, whose humble lives are easily overlooked, but who were central to the story of a pivotal period in British history.